curate, and reliable readings with the press of a button! Q: What exactly is a Digital Specific Gravity/Salinity Meter? important parameters in a saltwater environment. 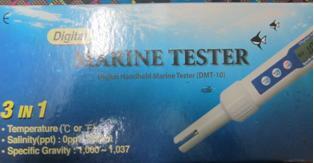 Q: Will an inexpensive floating or swing arm hydrometer be adequate? achieving a healthy and thriving biotope. a positively charged electrode to obtain a reading. 2. Refractometer – Measures the salt level by a Refractive Index. displayed onto a scale on the refractometer. ale is focused to obtain a reading. Q: Salinity & Specific Gravity – Are they the same? a TRUE specific gravity reading. Q: Why is temperature so important when it relates to Specific Gravity? Q: What is the ideal range for a saltwater aquarium?